While we didn’t have a chance to watch NFL commissioner Roger Goodell’s entire press conference live thanks to our day jobs, we’ve already read enough recaps and seen enough tweets to know that it was a disaster — and not just because of the random annoying Howard Stern guy. In short: he knows that domestic violence exists, he will establish a conduct ommittee, he has never considered resigning, and he’s “proud” of the “opportunity” to do a better job than the crappy one he did before. 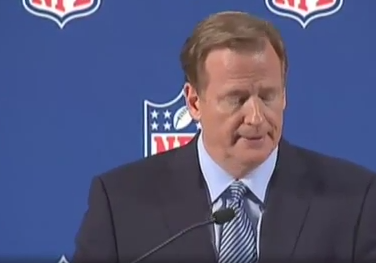 Goodell says that “domestic violence has no place in the NFL” as if it’s some kind of bold stance. And “nothing is off the table” except his own credibility. The main conclusion, though: he’s not very good at answering questions! Missing from Goodell press conference? Emotion. “Unfortunately over the last several weeks, we’ve seen all too much the NFL doing wrong. That starts with me. I said this before back on Aug. 28 and say it again now, I got it wrong in the handling of the Ray Rice matter and I’m sorry for that.